Thermal Fuse, China Temperature Sensor manufacturer. Our RY type thermal fuse uses an organic thermosensitive pellet inside a metal case. Thermal fuses (or thermal cut-offs) are "one-shot", non-resettable, temperature-sensitive devices that provides ultimate temperature protection in safety critical circuit. Thermal Cutoffs respond to temperature by interrupting an electrical circuit when the operating and/or environmental temperature exceeds the thermal rating of the thermal fuse. This is accomplished when the organic pellet experiences a phase change, allowing the spring activated contacts to permanently open the circuits. They are mainly defined by their temperature setting but also by the current rating, which is the maximum continuous current that can be applied. Thermal Cutoffs respond to temperature by interrupting an electrical circuit when the operating and/or environmental temperature exceeds the thermal rating of the thermal fuse. 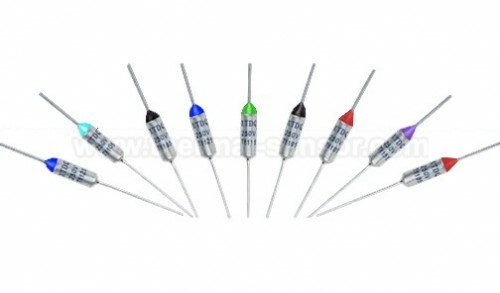 Thermal Fuse(Temperature Sensor) has been presented above, want more related products, please click the category below.